Muriel Spark: What is this I’m reading? We hear from Hannah Van Hove who is currently researching and writing at Glasgow Women’s Library ahead of ‘Narrative Experiments’ on Saturday 25th August, 2pm to 4pm which will spend an afternoon exploring the influences and legacies of the experimental women writers Christine Brooke-Rose, Anna Kavan, Ann Quin, and Muriel Spark. More information about ‘Narrative Experiments’ will be available at our Summer Programme Launch on Thursday 24th May. We’ve invited Hannah to share her insights on reading Muriel Spark as part of our Open the Door online festival on Friday 18th May. 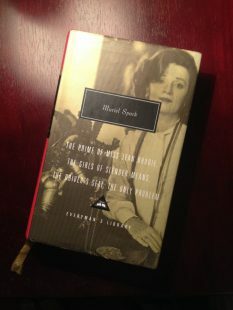 I remember reading the first Muriel Spark work I encountered quite vividly. I was in my second year of university and her 1970 novella The Driver’s Seat was a set text on my English Literature course. My other five flatmates and I had organised a party the night before and I had, unusually, woken up early, unable to go back to sleep. I vaguely seem to remember intending to get started with the clean-up of the flat and maybe pottering about a little, surveying the empty bottles and cans used as ash trays, half-heartedly picking things up, moving them around in that morning-after-the-night-before haze, hoping that my roving round the flat might rouse someone else. It didn’t and I listlessly returned to my small basement room, flopped down on my bed, and somewhat reluctantly – I wanted to “relax”, not “read for uni” – picked up the Spark book I had dutifully bought earlier that term. It was an Everyman’s Library edition which included four of Spark’s novels and it had a yellow ribbon to use as a pagemarker. I read The Driver’s Seat in one go, only pausing for the toilet (and then only when I was sure I wouldn’t bump into any of the flatmates who’d now started making noises round the flat), changing positions on my bed, trying but failing to be completely comfortable. What is this I’m reading?, I remember thinking, enthralled by this spiky, beautifully-crafted, dismaying piece of writing – who is this I’m reading? I’m currently writing an essay on Spark as part of the Muriel Spark 100 programme which positions her amongst the lesser-known experimental writers Christine Brooke-Rose, Anna Kavan and Ann Quin. 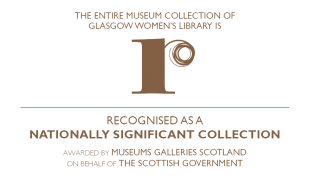 As part of this project, I’ve been making trips to the National Library of Scotland over the past few weeks to conduct research in some of Spark’s papers. 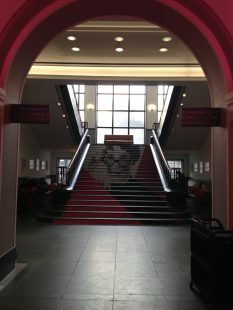 Entering the National Library of Scotland, I am struck by how Spark is everywhere: to the right, a huge poster announces the exhibition ‘The International Style of Muriel Spark’; to the left people peer into a glass case which houses a first edition copy of The Prime of Miss Jean Brodie; right in front of me, it’s impossible to miss the huge portrait of Spark herself, peering over her glasses, imprinted on the carpet up the stairs leading to the reading room. Who is this I’m reading? In Spark’s novel Loitering with Intent, published in 1981, the narrator Fleur recounts a moment where a thought enters her head ‘in a most articulate way’: ‘How wonderful it feels to be an artist and a woman in the twentieth century’. This is an idea which Fleur repeats at various points throughout the novel. On the course I teach on at university, where this book is one of the set texts, my students and I ponder upon this repeated statement. As I read through letters in Spark’s archive, I ponder upon this repeated statement. As I think about the other experimental women authors I’m writing on, I ponder upon this repeated statement. The question that formulated itself in my head on my first encounter with Spark’s work – what is this I’m reading? – is a question which is repeated over and over again in the archive, in the many letters of her readers who would like to know, who in some cases absolutely insist to know, how Spark herself would classify her writing. Responding to many of these letters, Spark pushes back at this question, refusing to be drawn on it – reading her replies in the National Library’s Special Collections Reading Room I sense a tone of wry amusement, slight bafflement at the importance placed upon it. What is this I’m reading? Get involved in Open the Door on Friday 18th May by joining conversations online (Twitter, Facebook, Instagram) using #OpentheDoor2018. Hannah Van Hove has proposed some questions for audiences to consider: How do we classify Spark? Where is she situated in the canon (what canon? Scottish? British? European?) How do we classify her work? What is the relationship between success and experimentation? Can Spark be considered the successful Scottish female novelist? What implications does such a designation have? What does it say about other novelists? The way we think about/value ‘Scottish literature’? Scottish women writers? This entry was posted in Blog, Lifelong Learning Blog, Reading Ideas and tagged with ms100, Muriel Spark, Open the Door.